Frontal Lobe: The frontal lobe is the largest of the four major lobes of the cerebral cortex in the brain. The frontal lobe, located at the front of the brain, of each cerebral hemisphere in front of the temporal lobe and the parietal lobe. The frontal lobe is separated from the parietal lobe by a groove in tissues called the central sulcus, and of the temporal lobe by a deeper groove named the lateral sulcus. The most anterior rounded portion of the frontal lobe is identified as the frontal pole, one of the three poles of the cerebrum. The precentral gyrus, a part of the frontal lobe immediately anterior to the central sulcus, holds the primary motor cortex, that controls voluntary actions of particular body parts. The frontal lobe comprises the maximum of the dopamine-sensitive neurons in the cerebral cortex. The dopaminergic system is linked with reward, attention, short-term memory tasks, planning, and motivation. Dopamine serves to limit and pick sensory information reaching from the thalamus to the forebrain. The frontal lobe can be divided into a lateral, polar, orbital) and medial part. 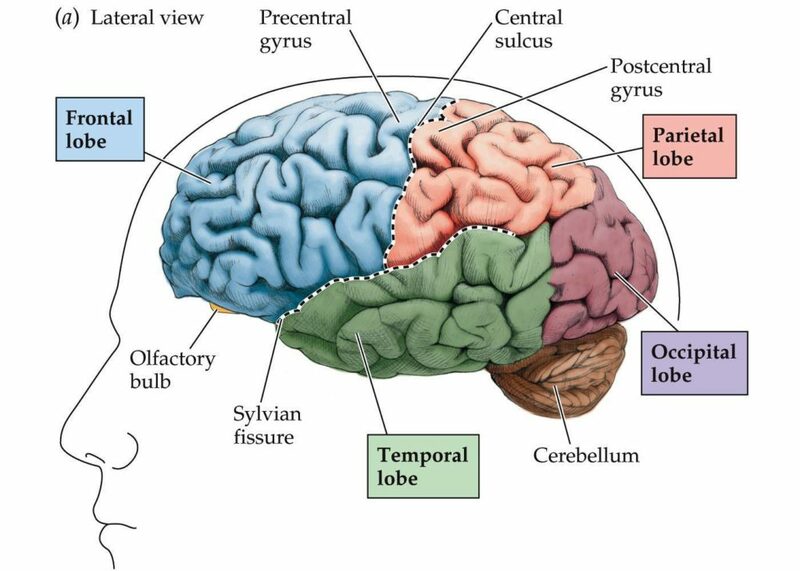 Each of these sections consists of a particular gyrus: On the lateral surface of the brain, the central sulcus divides the frontal lobe from the parietal lobe. The lateral sulcus divides the frontal lobe from the temporal lobe. The lateral part contains the superior frontal gyrus, middle frontal gyrus, inferior frontal gyrus. Polar part contains the transverse frontopolar gyri, frontomarginal gyrus. The orbital part contains orbital gyrus, anterior orbital gyrus, posterior orbital gyrus, medial orbital gyrus, gyrus rectus. The medial part contains superior frontal gyrus, cingulate gyrus. 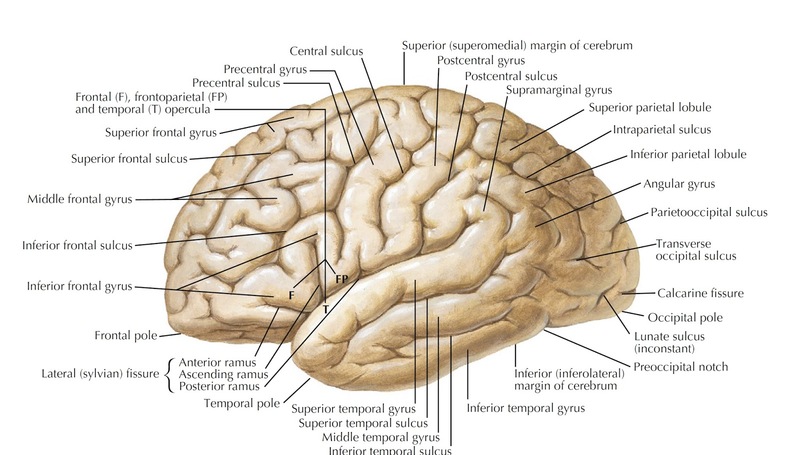 The gyri are divided by the sulci. The precentral gyrus is in front of the central sulcus and backward the precentral sulcus. The superior and middle frontal gyri are separated by the superior frontal sulcus. The middle and inferior frontal gyri are separated by the inferior frontal sulcus. The frontal lobe is located toward the front of the cerebrum, just back the forehead and below the frontal skull bones. It rests atop the temporal lobe, in front of the parietal lobe, and separated from the occipital lobe, with pieces of the limbic system. The limbic system is sometimes called the limbic lobe, that crossing all four brain lobes, including the frontal lobe. The central sulcus divides the frontal and parietal lobes, with the lateral sulcus dividing the frontal and temporal lobes. The frontal lobe performs a comprehensive role in the voluntary movement. The frontal lobe is home to the primary motor cortex which regulates activities like walking. 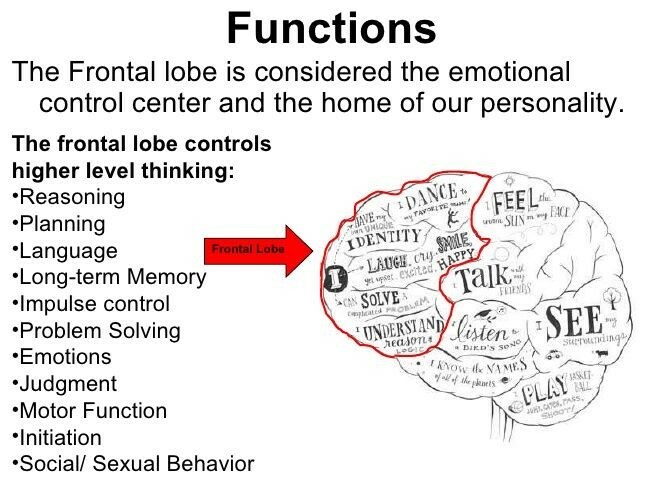 The role of the frontal lobe comprises the ability to project future outcomes occurring from current actions, the choice among good and bad actions, the override and elimination of socially unacceptable responses, and the perception of similarities and differences among things or events. Thus the frontal lobe plays an essential role in impulse control, including decisions regarding while to spend money and eat, and whether a selective decision is morally or socially acceptable. The frontal lobe further plays a significant part in integrating longer non-task based memories stored across the brain. Creation and preservation of long-term memories, especially emotional memories derived from the limbic system. The frontal lobe transforms those emotions to generally fit socially acceptable norms. Dopamine, a neurotransmitter that performs a role in reward and motivation, is profoundly active in the frontal lobe because of most of the brain's dopamine-sensitive neurons found here. Psychological tests that measure frontal lobe function include finger tapping the Wisconsin Card Sorting Test, and tests of language and numeracy skills. The frontal lobe performs a role in understanding language, semantic memories, and speaking. The frontal lobe damage can occur in a number of ways and result in various different results. Transient ischemic attacks are also known as mini-strokes, and stroke is common conditions of frontal lobe damage in older adults after 65 and over. These strokes and mini-strokes can happen due to the blockage of blood flow to the brain or as a result of the bursting of an aneurysm in a cerebral artery. Other processes, in which damage can occur include head injuries such as traumatic brain injuries contracted following accidents, frontal lobe epilepsy that can occur at any age and Alzheimer's disease or Parkinson's disease that causes dementia symptoms. Problems with planning, executive functioning, and attention. Incompetence to engage in immoral decision-making. Sudden and dramatic differences in personality. Variations in emotions, including signs of depression and anxiety. The trouble with understanding social cues or relating to the emotions of other people. Fluctuations in motor skills and spatial thinking abilities.